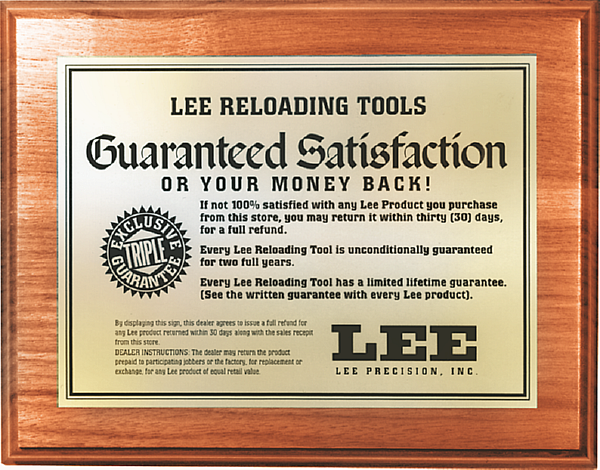 As a Lee Precision Master Distributor, FS Reloading is pleased to extend the Lee Reloading Tools Satisfaction Guarantee to all of our Lee Precision customers. You may get a full refund within 30 days if you are not 100% satisfied, from all participating dealers. Lee dies are guaranteed to produce ammunition with less bullet run-out than any other brand. Ammunition loaded with Lee collet dies are guaranteed to shoot the smallest groups, even when matched against custom bench rest equipment! Not so daring as they have already broken one world record. Lee reloading products are unconditionally guaranteed not to wear out or break from normal use for two full years or they will be repaired or replaced at no charge if returned to the factory. The Lee Precision lifetime conditional guarantee states that any Lee product of current manufacture, regardless of age or condition, will be reconditioned to new, including a new guarantee if returned to the factory with payment equal to half the current retail price. Another option is to send the product of any age back to the factory for repair. Labor is free and you are charged only for any parts that are necessary to get your product functioning properly.